Hameed Latif Hospital Lahore is a quality healthcare institution providing tertiary treatment to all types of patients under the care of foreign qualified doctors at affordable price. 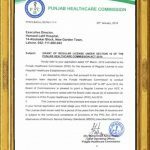 Punjab Healthcare Commission had evaluated Hameed Latif Hospital and has approved it to be the 1st Hospital in Punjab where all required standards of the Commission have been met in the provision of healthcare to the patients. Well Done! Hameed Latif Hospital’s staff for their committed effort for this singular achievement.